One of the most annoying things to find when you go outside to ride your ATV is gas sitting on top of your motor, transmission or pooled on the ground. Typically you can smell it well before you even make it to your four wheeler or dirt bike and you know what you’re getting yourself into.. Some trouble. If you have any sense of do-it-yourself work, then the fix for this gas leak is relatively easy and can be done in 15 minutes with the right parts. Let’s begin! The first step in fixing a leak, is finding where it is coming from. You don’t want to replace the seal on the bottom end of your carb just to find out you have a cracked gas filter. For the purposes of this write up, we are going to assume the gas is leaking from the petcock on your gas tank. More often than not, the issue originates from either the carburetor (see here for fix) or the seal on your petcock. Gas on top of your carburetor or pooled on your transmission. Less gas in your tank! Here is a simple test you can do to check for the leak. With gas in your tank, flip your petcock to ON. Wipe the petcock with a clean rag so that it is completely dry. Go inside and grab a drink. Check the petcock for fuel dripping, if so you’ve found the cause of the gas leak. Drain the gas in your tank by removing the gas line to your carburetor and inserting it in a clean bucket or in a gas container. Turn the petcock ON and let the gas drain completely from the tank. Alternatively, you can remove the gas tank from the quad and then then pour the gas out of gas filler inlet. Typically, four wheelers have a plastic cover over the gas tank to keep it protected which will need to be removed first. All 3 of my ATVs have had a 4 to 6 screws holding the cover on the tank. At least 2 at the hood, 2 under the seat or the back of the cover, and then most utility quads have 2 screws I the sides of the cover. Once removed you should be able to see the bolts/screws holding the tank onto the frame of the ATV. Remove these screws and you should be able to remove the entire tank. Most air filter boxes will share the same space as the gas tank, so you may be required to remove it to remove the tank. Now that the tank is removed, we can locate the source of the leak. To start, remove the petcock valve from the ATV and inspect the seal. Depending on the age of the ATV, there will likely be some deterioration of the seal between the petcock and the tank. 9 times out of 10, the seal is not working properly which is letting gas escape and drip onto the ATV or floor. The other place to check is inside the valve itself. 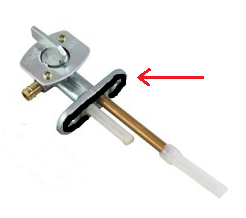 If the gasket around the valve ball is damaged, this may cause gas to leak past the valve and into your carburetor or (rarely) through the face of the petcock valve. 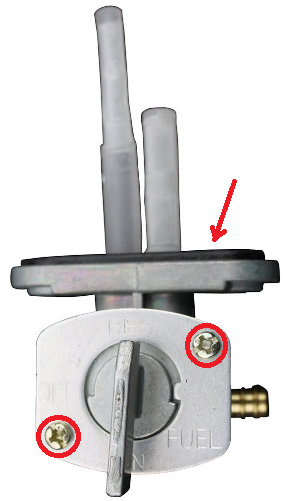 In the photo to the right, the arrow denotes to the valve seal and the circles denote the screws needed to be removed to check the valve ball and seat. You have two options when replacing a bad valve seal. You can replace/fix the seal or purchase a new petcock valve. Price-wise, there is little difference unless you already have some RTV sealant (free), otherwise a new petcock will set you back less than $10 in most circumstances (See New Petcock Valves Here). To fix your existing seal, pick up some RTV from your local auto parts store. RTV is often used for auto parts sealant and is resistant to gas, oil and heat, so it is perfect for this fix. Step 1: Remove the old gasket and clean the mating area on the gas tank and the valve. While RTV is gas resistant, existing gas or chemicals on either surface will prevent proper curing of the sealant and may create a leaky seal. Step 2: Apply a bead of RTV to the petcock valve seat creating a solid gasket around the outer edge of the valve. See photo to the right. Ensure that the bead has no breaks which which prevent a seal around the entire valve. If needed, you can use your finger to smooth out the RTV to ensure adequate coverage. Step 3: Reconnect the petcock valve to the gas tank and tighten screws to factory specs. Remove any excess RTV that seeps from the sides of the valve with your finger and a paper towel. Wait at least 24 hours before adding gasoline back to the tank. Once the gas tank has been reinstalled onto your ATV and you have allowed 24 hours for drying time, refill the gas tank. Turn the petcock valve to ON and check for immediate leaks in the seal. Allow about an hour and check again for any gas dripping. If done correctly, you should be the proud owner of an ATV that no longer has a gas leak from the petcock valve! Go out and enjoy a ride. You earned it!